The omnibus edition of the revised Confluence trilogy is published today as a trade paperback and ebook editions in all formats. A fat doorstopper of a package of 994 pages containing three novels - Child of the River, Ancients of Days, Shrine of Stars - and two associated short stories, 'Recording Angel' and 'All Tomorrow's Parties.' It's taken a few years and some hard work to get it back into print, so I'm thrilled that it's now been released back into the wild. ﻿﻿At first the houses were no more than empty tombs with narrow windows chipped into their carved walls and smoke-holes cut into their roofs, improvised villages strung along the terraces at the old edge of the Great River. The people who lived there were very tall and very thin, with small heads and long, glossy black hair, and skin the colour of rust. They went about naked. The chests of the men were welted with spiral patterns of scars; the women stiffened their hair with red clay. They hunted lizards and snakes and coneys,collected the juicy young pads of prickly pear and dug for tuberous roots in the dry tableland above the cliffs, picked samphire and watercress in the marshes by the margin of the river, and waded out into the river’s shallows and cast circular nets to catch fish, which they smoked on racks above fires built of creosote bush and pine chips. They were cheerful and hospitable, and gave food freely to Yama and Prefect Corin when they halted at noon. Then there were proper houses amongst the tombs, straggling up steep, narrow streets, painted yellow or blue or pink, with little gardens planted out on their flat roofs. Shanty villages were built on stilts over the mudbanks and silty channels left by the river’s retreat, and beyond these, sometimes less than half a league from the road, sometimes two or three leagues distant, was the river, and docks constructed from floating pontoons and the cut-down hulls of old ships and barges, and a constant traffic of cockleshell sailboats and barges, sleek fore-and-aft rigged cutters and three-masted xebecs hugging the shore. Along the old river road, street merchants sold fresh fish and oysters and mussels from tanks, and freshly steamed lobsters and spiny crabs, samphire and lotus roots and water chestnuts, bamboo shoots and little red bananas and several kinds of kelp, milk from tethered goats, spices, pickled walnuts, fresh fruit and grass juice, ice, jewellery made of polished shells, black seed pearls, caged birds, bolts of brightly patterned cloths, sandals made from the worn rubber tread of steam wagon tyres, cheap plastic toys, cassette recordings of popular ballads or prayers, and a thousand other things. The stalls and booths of the merchants formed a kind of ribbon market strung along the dusty shoulder of the old road, noisy with the cries of hawkers and music from cassette recorders and itinerant musicians, and the buzz of commerce as people bargained and gossiped and argued. When a warship went past, a league beyond the crowded tarpaper roofs of the shanty villages and the cranes of the docks, everyone stopped to watch it. As if in salute, it raised the red and gold blades of its triple-banked oars and fired a charge of white smoke from a cannon, and everyone along the old road cheered. That was when Yama realised that he could see, for the first time, the farside shore of the Great River: a dark irregular line of houses and docks. The river was deep and swift here, stained brown along the shore and dark blue further out. He had reached Ys and had not known it until now. The city had crept up on him like an army in the night, the inhabited tombs like scouts, the streets of painted houses and the tumbledown shanty villages like the first ranks of foot soldiers. It was as if, after the fiasco of the attempted rescue of the palmers, he had suddenly woken from a long sleep. There's another useful lesson in Kidnapped (from which Greene so approvingly quotes) - the way in which, as Margot Livesey puts it, Stevenson describes 'landscapes that both shape and reveal the actions of the characters.' This isn't about the way in which landscapes can reflect emotional weather or moral character. That can be useful, no doubt - especially in science fiction and fantasy, outwith the constraint of depicting real landscapes. But it can tend towards the pathetic fallacy: goodness inhabiting lovely woods of silver-leafed trees and evil lurking in lands ruined by dark satanic mills; the functional logic of future cities depicted by clean white towers linked by monorails. But I mean instead the ways in which characters can be shaped by the landscapes of their childhood, and how their responses to new landscapes can reveal their strengths and weaknesses. To give a trivial example of the former, Yama, the main protagonist of the Confluence trilogy, is raised in a semi-military household sited in a vast and ancient necropolis. He values order and hierarchy, nurtures an ambition to become a soldier, and is steeped (more than he realises) in casual, everyday encounters with the past. All of this affects his ideas about the wider world, and influences his plans and the way he attempts to overcome the obstacles he encounters. The shape of his travels down the length of his world was already laid down in the bone-white paths between the tombs where he played as a child. As for how landscape can reveal character, there's nothing better than those chapters of Kidnapped in which David Balfour and his friend Alan Breck (who crossed blades with Mr Shaun in the passage quoted by Greene) tramp across the heather of the Scottish Highlands after escaping a shipwreck. Stevenson's evocation of the spare, bleak nature of the landscape is masterly, as is his exploration of the different reactions of David, a Lowland Scot pitched headlong into this alien territory, and Alan, who was raised there. The hardships they endure expose their differences and test them to breaking point; yet each has qualities the other needs to survive their adventures. 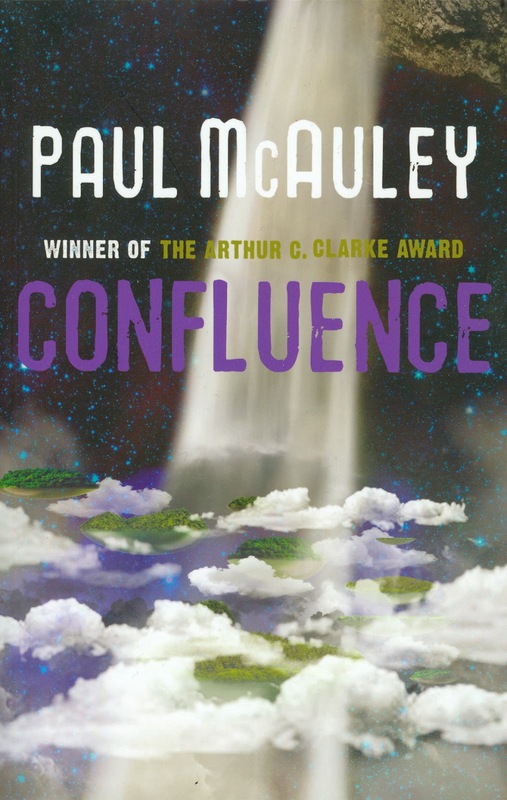 Confluence is structured as the long journey of a young man searching for the truth of his life: who he is; where he came from; where he's going. Yama travels from his childhood home to the capital, and then doubles back and heads downriver towards the world's end. All the while I kept in mind lessons learned from Stevenson's use of landscape and character, especially in the passages in which Yama's self-appointed squire, Pandaras, searches for his master and helps him reach what they mistakenly believe will be the end of their journey. And I also kept in mind the plain fact that even the most hostile landscape is indifferent to human suffering. Surviving it is a hard test, but surviving the people encountered in it is even harder.